Picture credit : Ho Ah Choon, "Sarawak in Pictures 1940's - 1970's "
Bintulu river mouth, left bank facing uptstream. In 1867 an Italian botanist named Odoardo Beccari entered the 'Kuala Bintulu' or the Bintulu river mouth. He wrote some very valuable information about Bintulu in his book entitled " Wanderings in the Great Forests of Borneo". It was a memorable time because in that year too the first Council Negeri meeting was held in Bintulu. 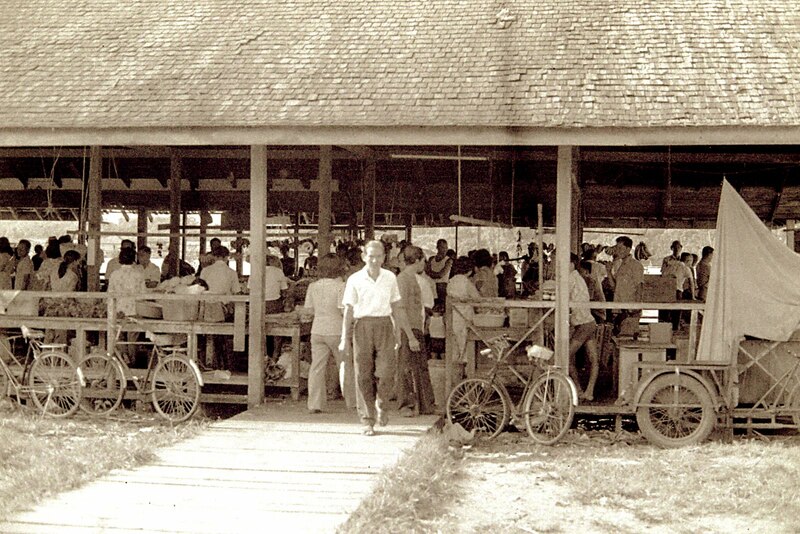 The meeting marked the early beginnings of democratic government in Sarawak. As a young boy in the 1960's I used to go for afternoon walks from the town to the Kuala to enjoy the sea breeze and sunset with my grandpa. 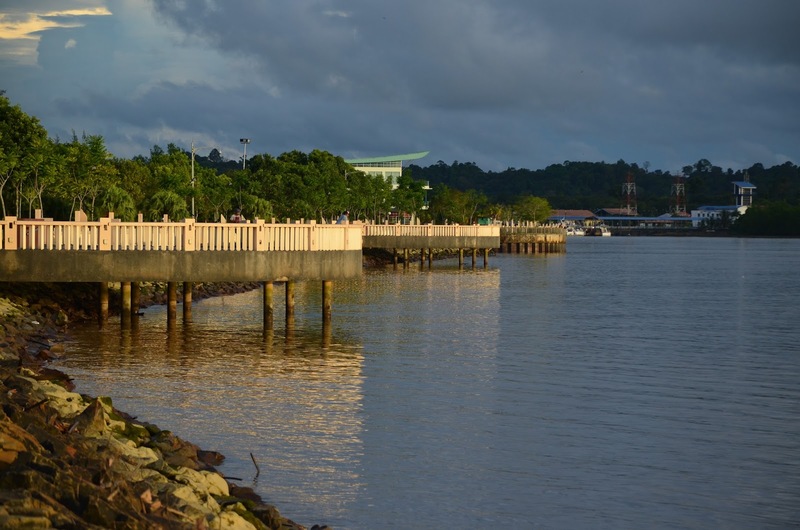 The river mouth played a very important role in Bintulu history for it was the main gateway for goods and people to reach Bintulu or to go out of Bintulu. For instance, Beccari wrote in 1867 that the Melanaus were fishermen but a great number of them were engaged in sago making. Beccari noted that the Bintulu sago is one of the finest quality and is in great request even in Sarawak. The importance of the Kuala diminished with the construction of a federal port at Tg. Kidurong some 40 kilo meters north of the Bintulu town starting in 1979.. Today only small coastal boats and ships, tugboats, timber barges and fishing vessels use the Kuala for their importing or exporting of goods. 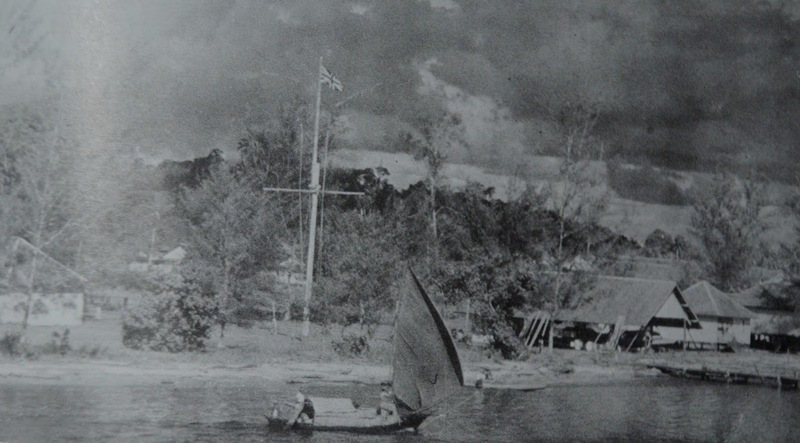 Pic shows the Melanau fishing boat called "Barong" sailing into the river mouth. My male classmates in group photo with our teacher Hasseri Lias who taught us for a short period as a trainee teacher from Batu Lintang Teacher Training College ,Kuching. At the background is the government boat shed. At the left background is partly seen the government wharf. Photo taken on 14th June, 1962. I am at the extreme right, front row. 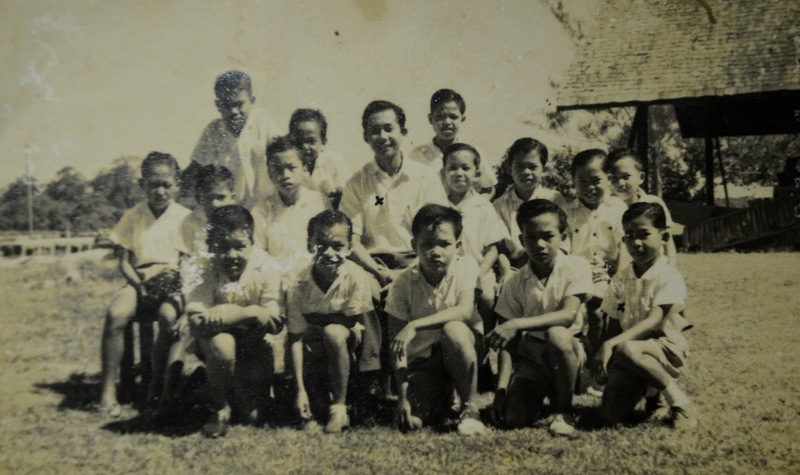 I have fond memories of Kuala Bintulu because as a young student of St. Anthony School in 1962, one year before Sarawak formed Malaysia, we studied in a house turned classroom situated by the right bank of the Kemena river going out to sea. During break time we would chase crabs on the clean sandy beach and threw stones at fishes in the river. Studying was a breeze because we had the beach frontage. 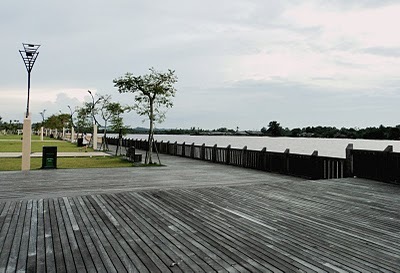 The right bank of the river (going out to sea)...is now developed into the longest waterfront in Sarawak having a total length of 4 kilometers. Picture taken in July, 2013. Today the Kemena river that flows by the original town of Bintulu is used for river regatta and power boat racing.